Last night I was able to go out and buy the last of the items on my children's school supplies lists given to us by their soon-to-be teachers. If you can believe it, I had 5 lists between our 3 children. Some of the things on the lists were just common sense items, like a backpack for instance. Other things were very specific, like liquid hand soap in a pump and large glue sticks. It always amazes me how one class' list can differ so much from another's. Still, I don't mind picking up these things throughout the summer, if it means that the teachers will need to spend less of their own money to have the basics for their classrooms. As I was packing the school supplies up into separate bags for each classroom, I started to think about how some families cannot even afford to buy their children backpacks or lunchboxes, never mind all these other supplies in front of me, like antibacterial wipes and gallon-size food storage bags, none of which are inexpensive. 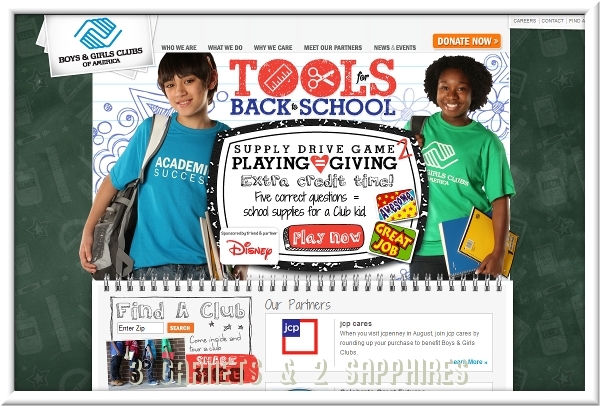 That is why I think the combined effort between Boys and Girls Club of America, Disney, and JCPenney to make going back-to-school a better experience for less fortunate children is such an admirable one. How can you help? Here are two easy ways . . .
1. 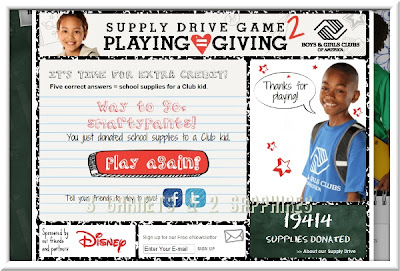 Visit bgca.org and play the Tools For Back to School "Supply Drive Game" sponsored by Disney. All you need to do is answer 5 trivia questions correctly about BGCA and school supplies will be donated to a child member of the club. The questions are multiple choice and, if you get one wrong, it let's you try that question again. This costs you nothing, but 2 or 3 minutes of your time. 2. When you shop at your local JCPenney during the month of August, support JCP Cares in benefiting the Boys and Girls Club of America by rounding up your purchase. What does that mean? All you need to do is round up your purchase total to the nearest dollar and the difference will be donated to BGCA. For example, if your purchase total comes to $39.50, when you opt to round up, your new total will be $40.00 and $.50 will be donated towards this worthy cause. You may think a little change does not sound like much, but when it is combined with a little change from thousands of shoppers, it can add up to quite a lot. You can learn more about both these initiatives by visiting bcga.org. While you're there, remember to checkout the useful back-to-school tips for parents and students, such as these tips about how to make homework time a more organized, positive, stress-free experience for both you and your child . . . I wrote this review while participating in a blog tour by Mom Central Consulting on behalf of Boys and Girls Club. I received a promotional item to thank me for taking the time to participate.